Check out our NEW video to learn more! Are you looking for a unique and exciting way to draw a crowd to your booth? DCL now has two exciting ways. Digital Caricatures Live and CaricatureKiosk.com! • Limitless output options like additional TV's / screens that we provide. • Social Media sharing options to Facebook, Twitter and email fast! 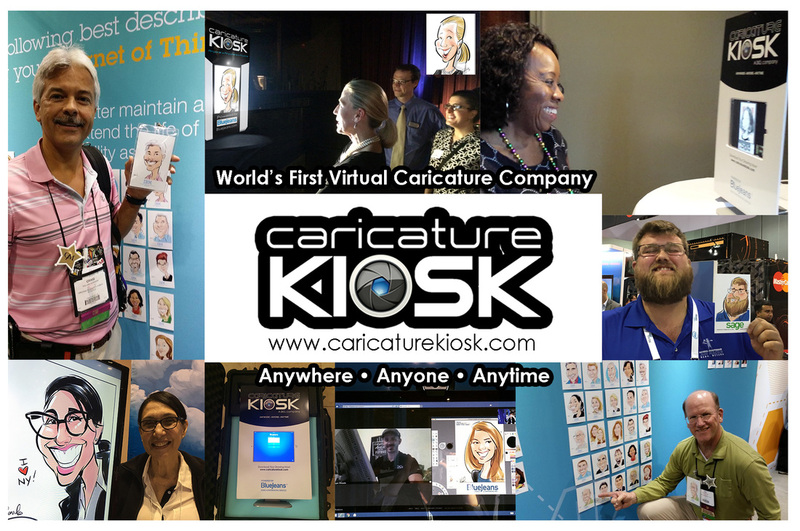 If you are looking for something BRAND NEW and UNAVAILABLE ANYWHERE ELSE in the world, check out what we are just created with www.caricaturekiosk.com! We have partnered with a leading video conference company out of San Fransisco to bring you an entirely new experience where your potential clients will be able to recognize you for thinking creatively and outside of the box. Introducing an virtual experience where we can now draw remotely and engage with the attendees or guests like we were right there. This allows for a very unique experience as the guests can see their drawings unfold before their eyes in minutes while seeing their artist who may be drawing them from Paris, NYC, Miami, Orlando, Chicago, or London. "The intrigue this creates is remarkable!" Check out the site ( Caricaturekiosk.com) or call 800-610-6341 to book your kiosk today and get the excitement back in your booth.